One of the things I love most about teaching is the continual learning process. I eventually became an “old teacher” but I never tired of learning “new tricks”. Several years before I retired, I participated in extensive professional development about math instruction. We were told at that time, we could no longer use TouchPoints for computation. I had used these successfully with my students for many years. So, what were we to do? Why, teach fact strategies, of course! I started down that path, never believing that this approach could be effective with my students, those with mild disabilities. Taking on the challenge, I not only modified this approach to meet the needs of my students, I became a firm believer that this is the way to go! What I learned is that kids go through three stages on the way to mastering basic facts. These stages are counting, applying strategies, and automatic recall. As much as I love TouchPoints, this approach, along with reliance on fingers or number lines, consigns kids to the counting stage. Just so there’s no misunderstanding… the counting stage is vitally important while developing conceptual understanding of addition and subtraction. It is also essential for composing and decomposing the parts of a whole. It is crucial to devote adequate time to this stage of development. However, whether counting all or counting on from the greater number, this approach by itself is neither efficient nor accurate in the long term. The continued use of counting does little to teach reasoning strategies. I still believe, for a relatively few students, using TouchPoints will be the most accurate and efficient method for computation. Some students, with minimal exposure and instruction, can invent effective mental strategies. Many others will require the explicit teaching of strategies. 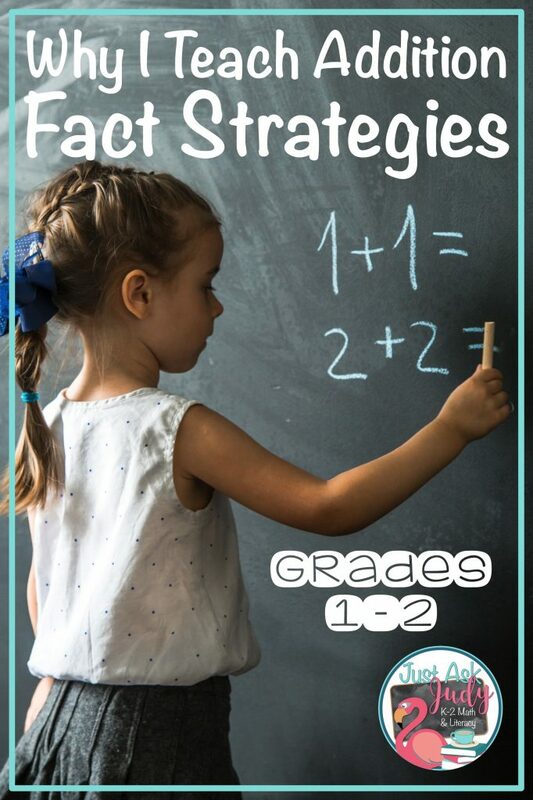 Learning and applying fact strategies is more accurate and efficient than counting and helps develop fluency. It is easier than memorizing 100 facts in isolation, may positively impact reasoning abilities, and assists with attaining automatic recall. This approach is appropriate for a wide range of students. 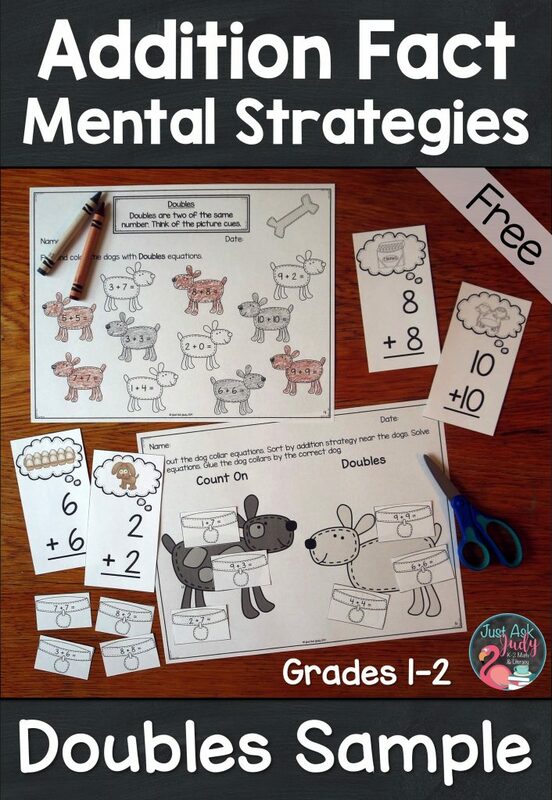 I recently updated my Addition Fact Mental Strategy Doubles Free Sample, which can be downloaded from my TpT store. 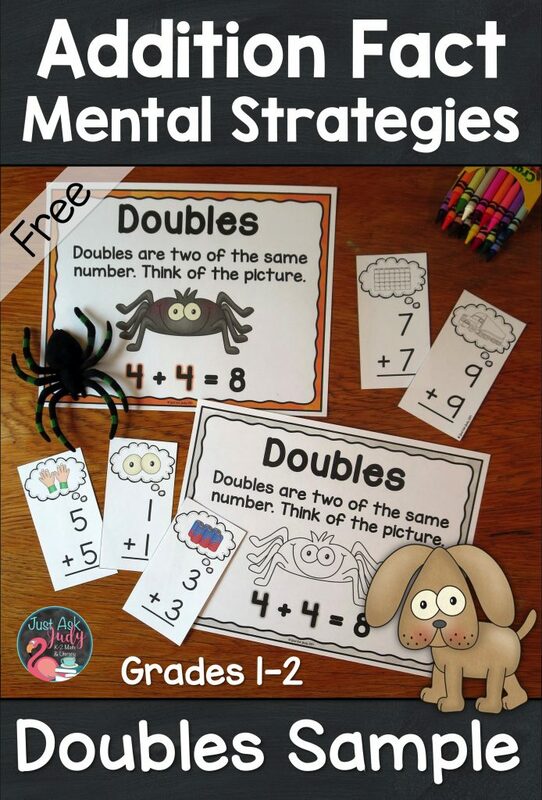 This sample includes a color and black/ gray/ white anchor chart, color and black/ white flashcards with visual cues, and 2 sample worksheets for identifying and discriminating doubles equations. I am so excited that my top-selling addition fact strategy anchor charts, flashcards, and worksheets have recently been given another cosmetic makeover. In addition, I added an option to use Count On as a strategy instead of Count Up. The strategies covered in each resource are Add 0, Count Up/ On, Doubles, Make 10, Doubles + 1, Add 10, The 9 Rule, The 8 Rule, and Monkey in the Middle. These resources are available individually or as a bundle. You can find this bundle and it’s individual resources, along with my subtraction fact strategy resources in the Addition and Subtraction category in my TpT store. 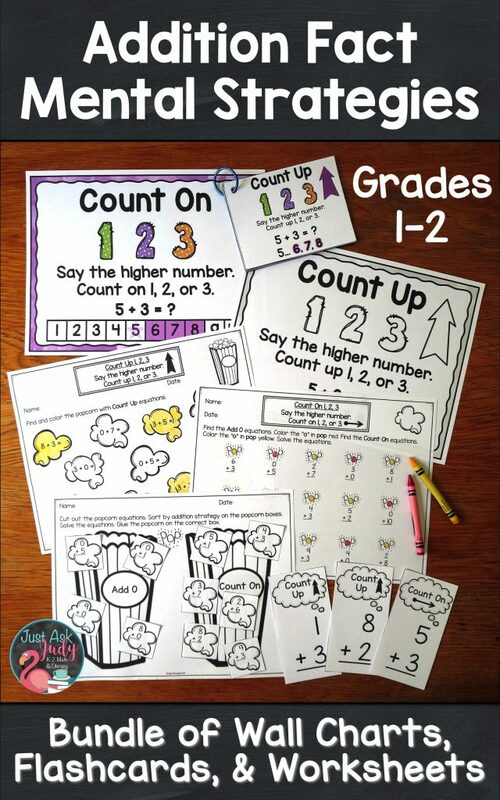 Read this blog post, How to Transition From Counting All to Counting On, for more ideas and another freebie. Which addition strategies are most effective with your students? Introduce each strategy using concrete materials. Ten frames and rekenreks are indispensable tools. Teach one strategy to mastery. Teach the second strategy to mastery. Practice discriminating and applying these two strategies. Then teach the next strategy. Teach your students where they are. They will learn and apply strategies at their own pace. Commit to spending the time it takes. Fluency in basic computation is an essential skill. Photo in title image by puhimec. This post was last updated on August 7, 2018. Judy, thank you for this! I have been looking for a system of explicit direct instruction for math facts. I agree touch points keeps kids in the counting stage, but only recently did I figure out perhaps using explicit direct instruction and teaching to mastery before going on could move a child to the next level. Typically, memorizing is the first goal tried after rekenrekscounting…flashcards, flashcards, flashcards…but there is not enough scaffolding for some kids to be successful with drill and repetition of facts alone. Explicit direct instruction does take work! It's how I have successfully taught reading using Orton Gillingham. I just didn't know of a ready-made program for math and was preparing to craft my own when I came upon your site. May the Lord bless you for all the hard work you've done; He's certainly blessed me by leading me here. Thanks again. Thank you, Margaret, for your kind words of encouragement! I never thought to compare this math program to the Orton-Gillingham approach for reading but there are many parallels.